I designed this routine specifically for working tables in banquet situations. 1 think you'll find it perfect for that, as well as virtually any other performing situation. You don't need a table at any point and you can work surrounded. It resets automatically as long as you remember to place the Monkey in the Middle cards in the same pocket, oriented the same way, at the end of the effect. # Don't skip the part about handing out the two Monhey in the Middle cards for examination at the start of the last phase. This not only makes this phase more amazing, it also guarantees that no one will be interested in examining the cards at the end of the effect when they can't be examined. For that reason, I suggest that, after you purchase the Bill Goldman effect, you make up another set using jokers. (Of course, doing so tuithout first purchasing the marketed effect would be stealing.) 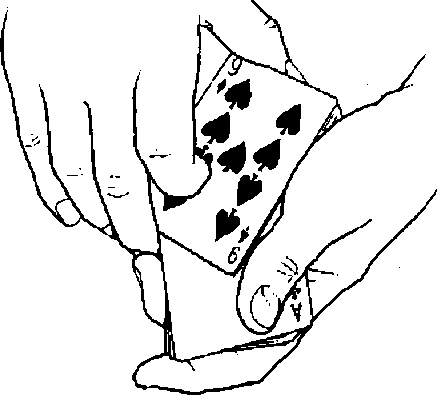 Pulling jokers out of your pocket looks natural, especially if you use a joker and an extra joker, since most people discard the jokers. It therefore looks as if you're simply making use of two jokers that you discarded from another deck. Make the set from a deck with an unusual back design and color so that you'll have adequate contrast whether performing with a red deck or a blue deck.